It’s overwhelming to know just how many fabric lines there are. Finding the right pattern is tough enough as it is, but adding on the time you’ll have to spend looking for the right designs to bring out the best in your quilt can be quite stressful. 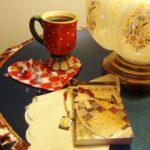 To alleviate you readers of this burden, the editors at FaveQuilts are always on the lookout for the best lines and collections that we think will help your quilt make a lasting impression. Lately, we’ve been very excited to receive not only a splendid fabric bundle, but also an equally beautiful pack of thread all from Clothworks. Their Basics Cloth and Thread show that you don’t need crazy designs and complex patterns to make a quilt of stand-out quality. Their basic bundle from the Impressions Moire collection immediately separates itself from other basic fabric lines with its rich hues and mysteriously intricate prints. Anything from beginner quilt patterns to more advanced quilt designs will have a more pronounced decorative quality that easily complements or contrasts your home, wardrobe, or anything else you’d like. There’s a timeless quality to the look that suits the classic and the contemporary for just about any occasion. It’s all too rare to have a basic bundle with such a high-end appearance that’s going to give your quilts a real boost in quality. When it comes time to focus in on the smaller details of your quilt, nothing will come in handy more than the Laurel Burch Thread. The pack includes a series of mako cotton with both solid and variegated colors. 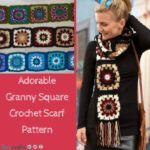 This gives you endless opportunities for making your free motion patterns, embroidery, and every other stitch within your quilt highlight the workmanship. 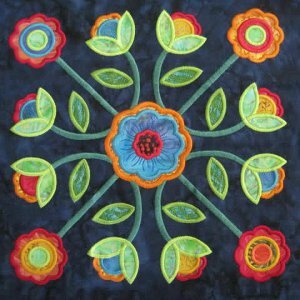 Make your applique quilt designs really pop with eye-popping colors that will bring out the best in any quilt pattern. Bringing out the best in your quilt doesn’t have to be difficult. Go back to basics with the Clothworks Basics Bundle and Thread, which includes both an Impressions Moire bundle and a 10 count thread pack. We’re ready to help you get started, so we’re giving away one of these Basics Bundle and Thread. All you need to do is enter on our site by the 17th. Embroider breathtakingly beautiful quilts with the Midnight Roses Embroidery Thread Collection from Aurifil. These rich, jewel-toned threads were chosen by Sharon Pederson and Elizabeth Phillips for their sultry Midnight Roses quilt, a masterpiece of embroidery. 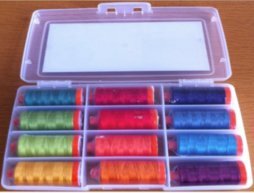 The kit includes 12 spools of 40wt 100% cotton thread in a variety of saturated colors from every shade in the rainbow. Each spool contains 1,094 yds. 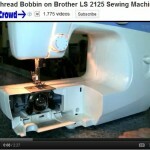 of thread so you can keep embroidering and quilting through several projects. You can tell the threads in the Midnight Roses collection are destined for vibrant, colorful quilts and embroidery projects because they don’t include a single neutral! 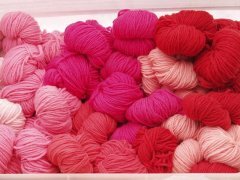 Starting with a deep raspberry, the hues of threads move through the color spectrum, stopping at dark red, vermilion, tangerine, orange, gold, chartreuse. moss green, and forest green. The cooler colors in the collection comprise teal, slate blue, and cobalt blue. 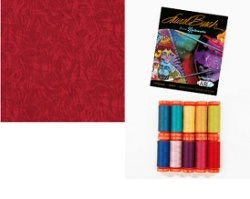 With these colors, quilters and needle artists can embellish any project with masterful artistry. FaveQuilts.com is giving away a Midnight Roses Embroidery Thread Kit to one lucky winner. It could be you! Contest ends June 12, 2012. You can enter once daily, so return often to improve your chances of winning! Amy Butler Thread Giveaway from Favecrafts! 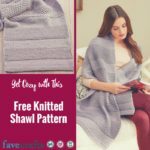 If you love to sew and embroider, you’re going to love the most recent giveaway from Favecrafts and Rowan Yarn. 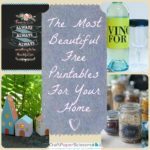 This beautiful collection of Amy Butler thread is great for all your spring and summer sewing projects! 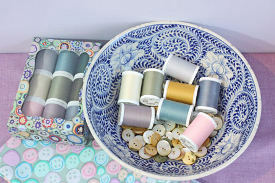 Complete with nine beautiful shades of pastel colors (Blue Ridge, Heather, Light Pink, Olivenite, Green Linen, Cream, Forest Green, Aqua, and Dark Silver), this premium thread collection is all you’ll need this year to create beautiful stitchery…and we’re giving away a full kit of this thread to one lucky winner! As a student of sewing myself, I absolutely love Amy Butler thread. It’s strong and durable and comes in a wide variety of shades. This collection, labeled “Stones”, is a particular favorite because I love all the bright spring shades! And the great thing about this boxed kit is that the yarn name and product number is marked on the yarn and the box itself, so if you run out in the middle of a project, you can jump online and order the exact shade you need with ease! The “Stones” box set of yarn, along with all of Amy Butler’s other collections, come in beautiful and durable boxes, so they’re great for giving! And when you’re done with the yarn, you can use the box to store all your little sewing supplies, like thimbles and pins. 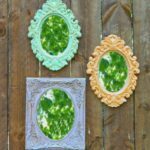 This is a great kit for anyone who loves a little splash of color in their projects! If you love to sew, be sure to register to win this Amy Butler thread collection today! All you need to do is visit the giveaway page and register to win. You can enter the contest once a day, so return often to improve your chances of winning. All entries must be in by April 13th…so hop on over to the giveaway page and sign up to win today! The Pat Sloan Starter Kit of Aurifil Thread includes 12 spools of basic threads for machine applique and machine quilting. Pat Sloan has chosen the 12 colors she uses the most, so you get all the essentials for quilting and applique. The Aurifil spools included in the Pat Sloan Starter Kit are filled with 1422 yards each of 50 wt, 100% cotton thread. This fiber content and weight is perfect for both quilting and applique. These threads can be used with either a sewing machine for machine applique and free motion quilting or with hand-sewing needles for hand applique and hand quilting. The Pat Sloan Starter Kit of Aurifil Thread makes a wonderful gift for a new quilter who hasn’t built up a stash of threads yet. It is especially useful for crafters fond of applique, since they need small amounts of threads in many different colors. These basic spools will be their go-to applique threads for years to come! 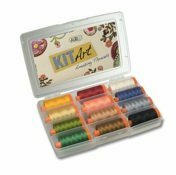 FaveQuilts.com is giving away a Pat Sloan Starter Kit of Aurifil Thread to one lucky winner. It could be you! Contest ends March 6, 2012. You can enter once daily, so return often to improve your chances of winning! You may find this tutorial hard to believe as being popular, but it has nearly reached 55,000 views. As crazy as this sounds, in my speed and excitement to get the machine unpacked, 3 components fell out of the machine. There was no instructions provided on how to get it back into place. 2 Hours of fiddling and trying to problem solve this, I finally figured it out. I had turned to YouTube to get a video from someone that did the same thing. There was nothing. So I said, after I figure this out, I am going to film how to get these components back into position. As simple as it appears in my video, there is no instructions on a diagram to show how the components are to work together. I hadn’t seen it in much detail before taking it out and therefore I wasn’t sure where things were suppose to go. This video is one of the highest commented videos in my collection. It’s people merely stating the obvious! “Thank You” for showing me the way. Behind the scenes, Daniel criticized it was a stupid video to film and I said no… it’s an opportunity to show how to fix something because I am sure I am not the only person that has done this and needs help. I credit myself with how many refunds and store returns has stopped as a result of this video. YouTube can be really phenomenal when it comes to learning something. Nothing says Spring like Spring Cleaning! Although housework is not at the top of my list of fun and amazing things to do, I get a kick out of Spring Cleaning. A fresh start! A new beginning! So Spring! I also discover things while doing my yearly clean-it, donate-it, or pitch-it celebration. And I do keep a list of those just-can’t-donate-or-pitch-it items. If something makes that list two years in a row, it’s donated to a better home where it will not get shoved in the back of a closet. Check out what I discovered this year in the video. A treasure that got used! If you don’t fall into those two categories, then read on to discover just how easy it is to mend your own clothes. Grab a needle and some thread. The thread should be about a foot and a half long, but there is no standard length to follow. Thread the needle by pulling one end of the thread through the needle’s eye. If your button has only two holes in it, repeat steps 4 and 5 until you feel you have secured your button adequately. If it has four holes, you’ll want to make x’s with your thread, going up through the top right hole, down through the bottom left, up through the top left, and down through the bottom right, repeating until the button is secure. To finish, knot the thread on the back side of the fabric and trim the extra. I always weave my needle under the stitches a few times to make sure it’s secure before cutting it. 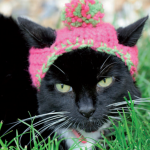 Even if you cannot knit or crochet, yarn still offers some great opportunities for crafting. You can use yarn to create decorative accents such as wreaths (holiday or seasonal), vases and hollow yarn balls. 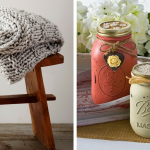 Using yarn to cover surfaces is inexpensive, durable and you can recycle old food containers like that Pringles can into something fun and functional. Kids will love creating a traditional Huichol Indian craft from Mexico with little more than craft sticks and different colored yarn. 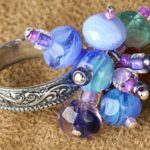 Even for those who DO crochet or yarn, these five yarn crafts offer some great opportunities to use leftover yarn from your stash. 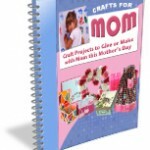 Check out how to make yarn wreaths,vases, hollow eggs, pencil holders and God’s Eyes in 5 Fantastic Yarn Crafts.